O QWERTY, Where Art Thou? Labels: French traditions, made me laugh, random, where am I? Geography is one of those subjects that I find difficult to learn just by staring at a map. There needs to be some way of integrating the knowledge: either by travelling through a place and studying the maps as you go, or else some sort of kinetic learning tool. Learning the geography of France was the one area of French class where I performed less than spectacularly. Abject failure. Nothing stuck in my brain. How could I remember what's a département, what's a région, and what is no longer a région officially though it's still referred to that way? And it's difficult not having the French home-court advantage of recognizing cars' provenance by the last two digits of their license plate. Sure, the knowledge began seeping in a bit over the past three years; but for all intents and purposes, I'm a bona-fide French-geography ignoramus. Ha! Well all that is about to change now that I have discovered Geographix, an educational internet game that tests your geography skills. It's really fun, even though I failed 100% my first go-round, and the professor figure was making uglier and uglier grimaces at me. I stuck my tongue out at him and carried on. I'm allowed only 10 games per day, but in a year that would be 3,650 lessons. I should be golden by then. Give it a try. Anyone want to challenge me to a French geo-quiz in March 2010? A few autographs I've collected over the years, mostly in the form of book dedicaces. I'm so glad to have re-discovered them. 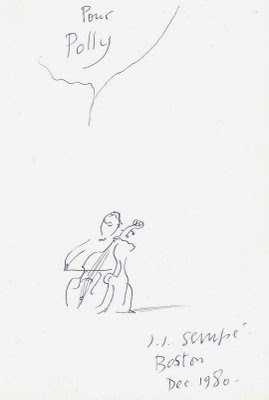 What I treasure most about the Jean-Jacques Sempé signature is, of course, the drawing. I wonder if he always signs autogaphs like this. A while back I wrote about meeting Marguerite Yourcenar. But actually, when I met her she had already been elected to the Académie Française. I'll blame my ignorance on youth. And Polly Platt's signing of French or Foe, the first time I ever met her some time in the 1990s. How prophetic; and little did either of us know that she was to become a good friend and part of my French dream-come-true. The good news: the shipment of my stuff from Paris finally arrived today, after four months of anxious waiting. It was all in fine shape. The bad news: in a totally fickle, very unexpected emotional about-face, I want to send it all back. There are two main factors at play here. Plus a third, more minor, reason. 1. The "Won't This Sombrero Look Great at the Neighborhood Pool Party, Honey?" syndrome. We've all done it. You travel to a foreign land, and everyone there is wearing a sombrero with red tasseled fringe, or puka shell beads or embroidered peasant blouses, and you think, "Gee, Ima gonna get me one a them," and then you carefully select and purchase just the perfect sombrero or what-have-you. You jubilantly take it home, and upon arrival in Little Rock you shake your head in disbelief. What was I thinking? you ask, And why did I really fight to place that sombrero so carefully into the overhead bin of the plane? (Or gawd forbid, you even wore it at the airport.) It is culturally out of context in your native habitat, but your foreign eyes didn't let you see it. Well, that's not true for all of the belongings that just arrived, but... well, let's see. That adorable confituriere from the flea market that was so, so charming in my old, tiled Paris kitchen? It looks like an uninvited floozy in my Virginia dining room. So I tried placing it in every room. It just looks cheap and embarrassing. Ditto for some of the more avant-garde items of clothing I bought in Paris or Ile de Re. Gee, an item or two of something unusual or offbeat to perk up the Paris daily mainstay attire was de rigueur... in Paris. If I wear some of this stuff here I may never get invited anywhere. Cleavage? Spiky heels? Don't get me started. It all seemed so ...normal in Paris. 2. The "I'm Not-Over-It-Yet" factor. It's a biggie. It's a damn good thing I'm heading to Paris in a week, because when I opened some of the boxes and unearthed items from my Paris daily ritual, I had a really hard time. As in tears, and I don't mean happy tears of reuniting with long-lost favorites. You know what I mean. Oh, you know. Say you've broken up with a boyfriend, for example, and you're not completely over him but you forge ahead and start a new relationship with some other guy; and while that new relationship is in its tender infancy, by some stroke of nauseating ill fate, up pops the Old Flame at a weekend house party. And you can try to tell yourself til you're blue in the face that it doesn't matter, that you've moved on, but all of a sudden inside your head Barbra Streisand is belting out "The Way We Were" even though you don't like her voice: "What's too painful to ree-meh-heh-em-bah, we simply choose too-wooo foh-or-get..."
Well, blow me down if I didn't have that reaction when I unwrapped, of all things, my coffee cups. 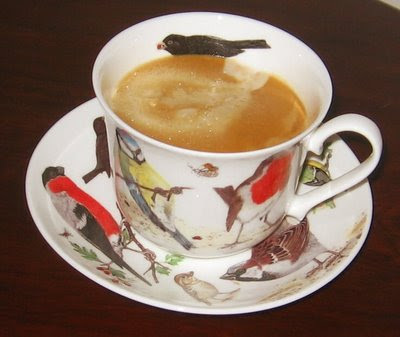 Excuse me, but how pathetic is it to have a weird, soppy emotional melt-down over four pieces of bone china? I felt as though I were acting in the middle of some Woody Allen movie talking to a shrink, "I'm sorry Dr. Proust, I don't know what came over me. I saw those cups and saucers, and all the memories of Paris Nespresso breakfasts came flooding back and I..., I..., I...., boo-hooo-ooo-waaaah." Heroine (me) bolts out of the shrink's office blowing her nose. She doesn't even shut the door behind her. 3. Minor factor: too much stuff. Must make placement decisions. Not easy to cope with any decision-making until factors #1 and #2 take a back seat. Labels: chez moi, nostalgia, where am I? Before I moved to Paris, I used to visit as often as time and budget would allow. When it came time to leave, I always found myself sobbing in my seat as the plane taxied for take-off on the runway at Charles de Gaulle. I know that's not exactly a sound reason for moving to Paris. On the other hand, life is short; so I guess it wasn't such a bad reason, either. I would have stayed forever. But life is life. Now. Ta-dah! After three months of serious Paris jonesing, I am finally going back, for une petite semaine. Six days in Paris. T minus ten days and counting. There's so much to do and so little time. Research, interviews, plus tedious banking and administrative details to settle. I can't possibly see all the friends I want to see, nor make the rounds of all the favorite haunts. If I stop by my old neighborhood (which I must) that will take at least half a day of catching up. Oh joy, oh rapture! I can't wait. I tried to be so very blasé and sophisticated about this return trip. But I will admit it: once my flight was booked I did jump up and down in the front hallway, cooing with glee, for three minutes. No one was looking. "Les Guignols de l'info" are all grown up! 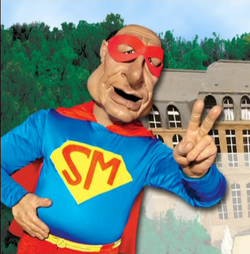 Tomorrow the famous French latex puppets of satire celebrate their 20th anniversary on TV. Canal+ is throwing them a party on Monday entitled "Putain, 20 ans!" Residents of France can watch the hour-long celebration on Le Grand Journal starting at 7:55 pm Paris time. The rest of us can see the party on line. As a special feature, some of the infamously spoofed political and media celebrities will appear in person. However, Jacques Chirac, pictured at left as "Super Liar," has said that he won't show up, but sends his best wishes. I adore les Guignols... except for the weird blob-eyeball-ectoplasm deal in the intro, which always gives me the creeps. It's a good thing I paid megabucks to haul seven suitcases of my belongings with me when I flew to the US from Paris in November. Why? Because the moving company who crated up the rest of my stuff has not exactly kept up their side of the deal. They were kind and courteous and packed everything so carefully in mid-November. They anticipated delivery of the shipment by December 30. I haven't seen it yet. They claimed a few months ago that the shipment cleared customs and is waiting to find space on a truck that is coming my way. Tomorrow and tomorrow and tomorrow, they promise. And trust me, the milk of human kindness is no longer flowing in my veins. But I'm not writing this to kvetch (okay, well, a little). It's just stuff, I know. However, that small crate of Paris stuff represents 95% of memories of my surroundings and activities from My Life in Paris. After a while it starts feeling as though Paris was but a dream. 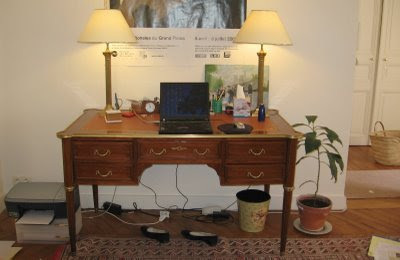 Didn't I have some interesting furniture from the Marche aux Puces at Vanves? Didn't I use to write at my faux-Louis-something desk? 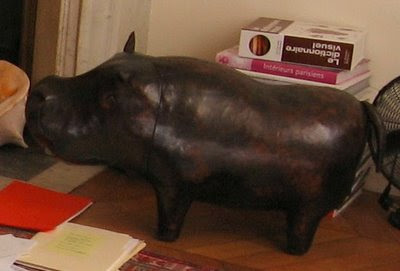 And where is Hubert, my beloved Omersa leather hippo footstool? Is it asking too much to have at least a few of the reminders of the life I had in Paris? The shipping company seems indifferent. Now they are not returning my calls or emails. I'm starting to worry. Fortunately, I brought the most precious lightweight flat objects with me. Prints and small paintings and such. Yesterday I picked up my favorite item from the frame shop. 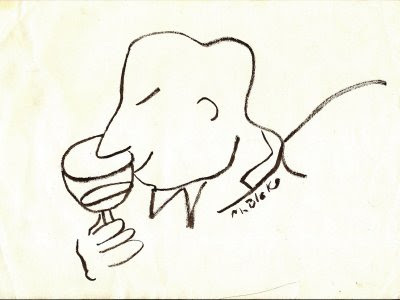 "Sommelier," a drawing by my friend Mary Blake. It now has a Bordeaux-red matte and a black frame. I feel more at home now. I have a small piece of My Life in Paris. But I still want my stuff. If you act fast and respond by today, you could win a DVD of the critically acclaimed 2008 French film I've Loved You So Long (Il y a longtemps que je t'aime), starring Kristin Scott Thomas, in France Today's contest for online readers. To enter the contest, just send an email to info@francetoday.com with your email address and the email addresses of five friends you think would enjoy the weekly newsletter, Le Petit Journal. Put DVD CONTEST in the subject line. If you're not already familiar with it, Le Petit Journal is the e-newsletter of France Today and France-Amerique. I was a long-time subscriber to the paper version of both before moving to Paris. Being transatlantic, I quickly became enamored of the online versions. And now France Today has revamped its website and is even more luscious than before. Great writing, photos, and insider tips: I think they mentioned my blog once. My quandary: back in the US I rediscovered my carefully saved, much beloved back issues of France Today. There is even more in the paper edition, more time to savor each article. Should I subscribe again? There is something so comforting about reviewing old issues. But so much paper. Oh well. I guess there's room for both. Can't stop to think on it too much. Must go enter that contest. 1. Who knew there was a Little Paris -- 20,000 strong-- in Brooklyn? "When they order French cheese, they pronounce it the right way... They do eat a lot of cheese." Read the story here. 2. What Frenchman holds the record for writing the longest sentence? It's Mathias Enard, in his novel, Zone. 150,000 words. One sentence. A lotta lotta commas. 3. Dinard, in Brittany, is a favorite spot of mine. And yes, I always do breathe better when I'm there. But whodathunk its salty waters were bottled into Afrin Nasal Spray? Well, it's actually a rinse. 4. France 24 TV news broadcasts are now available on your iPhone, live, in English, French, or Arabic. The app is a free download. Now all I need is an iPhone. 5. If you haven't read it yet, HuffPo's article on "What We Can Learn From French Women." I have now realized that there will never, ever be enough written about the allure and the habits of French women. The world has an insatiable appetite for their secrets to success. Keep reading! *** Update: I had to add one more news item by Charles Bremner. Apparently the funny/whiney French web site Vie de Merde is now available in Amurikan. A vos plumes! Three years ago yesterday I arrived in Paris. I was exhausted from a cyclonic effort to pack up my decades of adult American family life and organize it into storage bins. And downsizing to the the absolute essentials in five overstuffed suitcases to bring to my furnished Paris flat. My landlady -- soon to become a good friend -- had emailed me photos of the apartment, and said, "Everything's ready for you -- sheets on the bed and a bottle of wine waiting. Do you drink coffee or tea in the morning? Your phone and TV are all set. Can't wait to meet you!" All I had to do was arrive and collapse. Which I did. I had a vague notion of where the apartment was, on place de la Madeleine. Despite many previous trips to Paris, I was clueless about the prestige of the location, and was thus comforted by Francophile friends' instant enthusiasm for and approval of such a great address. Then that day in March I arrived raggedly and blearily from Charles de Gaulle airport, with deep circles under my eyes, lips chapped from a frigid New England winter. I lugged my five suitcases in sequence up the antique wrought-iron elevator, up the stairs to the top floor. And I collapsed on the exquisite fresh sheets. Jet lag mildly abated after a nap, I leaned on the windowsill, soaking in the view from my perch. I was awestruck. I could almost reach out the window and touch the Eglise de la Madeleine. Everything seemed otherworldly from this vantage point. So I ventured down to explore the neighborhood. 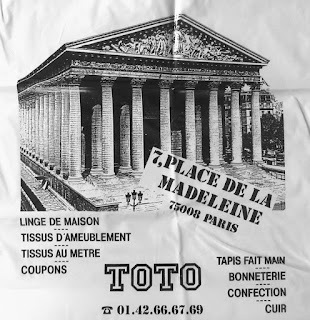 At the ground floor of the building was a discount textile store called Toto. But I was in France now. Would anyone understand the joke?